I was taking food to a family who had recently had a baby and wanted to treat them to a healthy, yummy dessert. I was kind of over the whole chocolate thing (at least for a couple days haha) and wanted something lighter that reminded me of warmer, sunnier days. 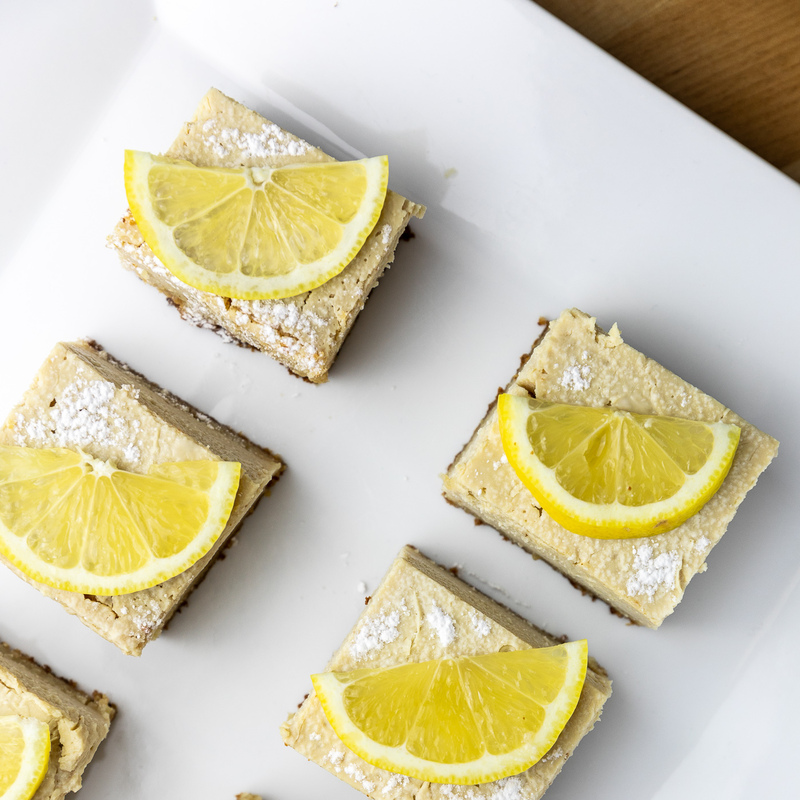 Which led to the creation of these lemon bars! Think salty and sweet pie crust meets a sweet and sour filling that will remind you of the creamiest, dreamiest lemon cheesecake ever. These were absolutely divine and as always vegan! And I went the extra step to make them gluten-free and refined sugar free since our friends were avoiding it. 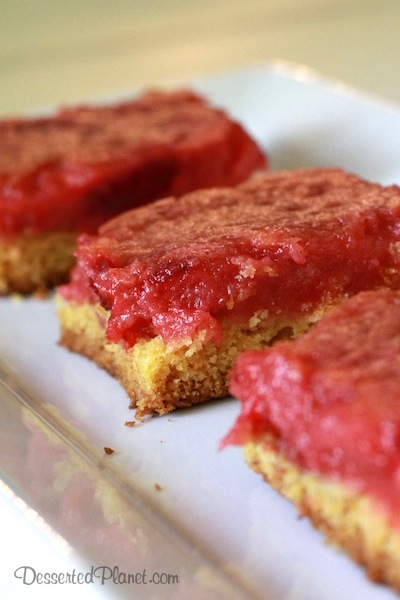 The winter days are gray and loooooong right now….lighten things up with these yummy bars! Preheat the oven to 350 degrees. Line a 9x9 pan with parchment paper. 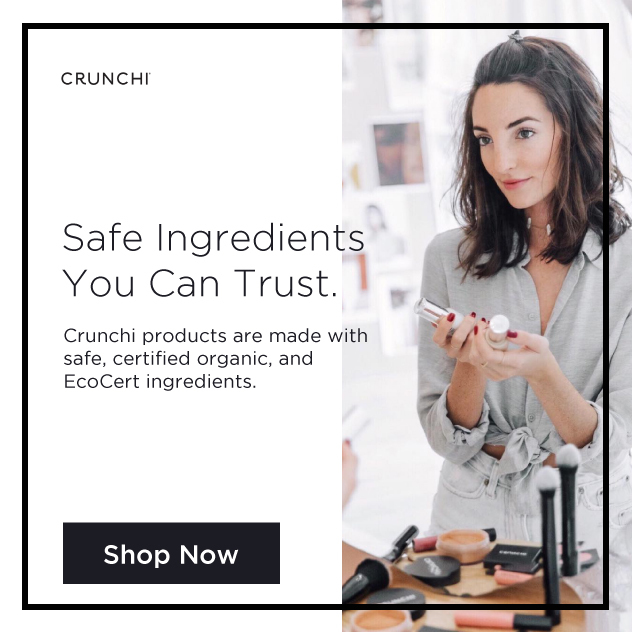 In the bowl of an electric mixer on medium speed, beat the butter, monkfruit sweetener, sea salt and vanilla until everything is smooth and creamy. Beat in flour and lemon zest. Gently press down into the bottom of the 9x9 pan with your hands. Bake for 5 minutes then allow to cool. Make filling while the crust bakes/cools. Place the tofu, cashews, lemon juice, salt, lemon zest and classic monkfruit sweetener into a high powered blender and blend until smooth and creamy. Add the powdered monkfruit and cornstarch and blend again on high until everything is well combined. Pour evenly onto the prepared crust and bake for 35-40 minutes until the filling is set. Let cool completely on a wire rack and then chill in the refrigerator overnight. Dust with powdered monkfruit sweetener just before serving. 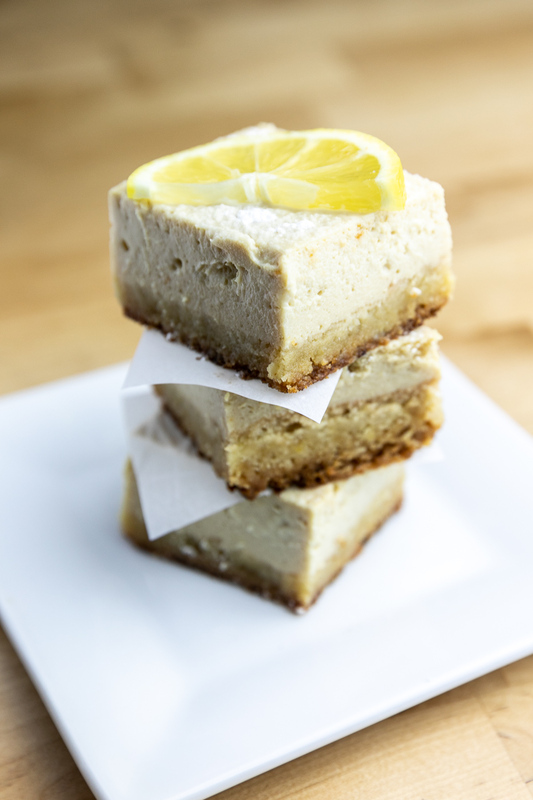 I was craving something lemon-y and easy to make the other day and found this recipe that I have only made once before quite awhile ago but remember really loving it! They are done in the food processor and come together in no time. They are a perfect balance of coconut and lemon flavor, not overly sweet and just the right size when you need something a little sweet. And best of all they are healthy! P.S. Here are a few more energy type “balls/truffles” I love! Process all ingredients except the white chocolate/extra coconut in a food processor until a thick paste forms. 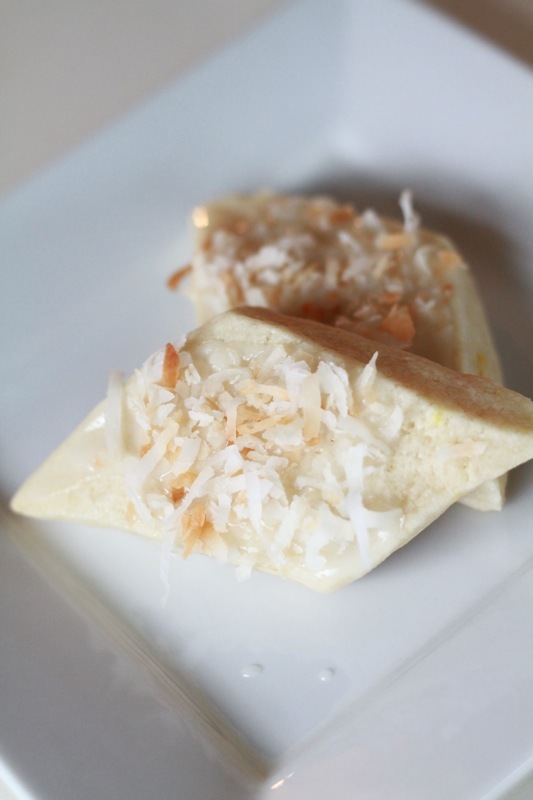 Dip into the melted white chocolate OR roll in extra coconut (I didn't do either this time but the time before I did the white chocolate). 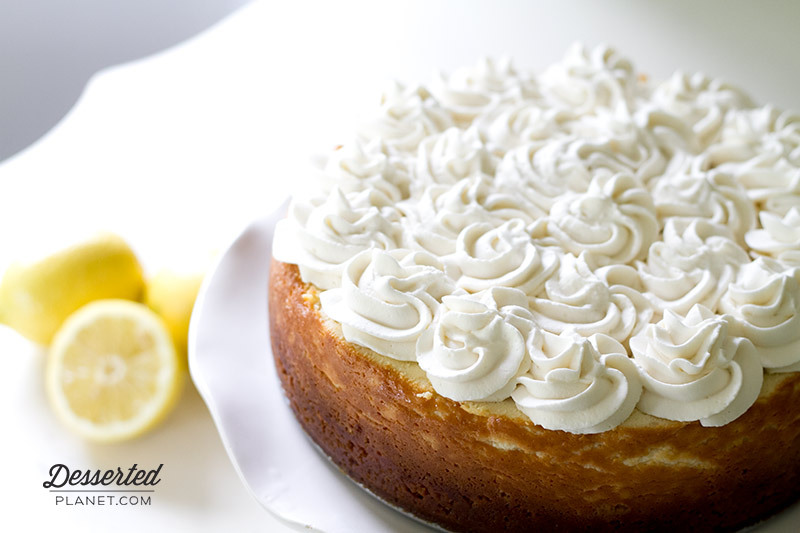 Cheesecake is one of my all time favorite desserts, especially New York style cheesecake. So a couple of weeks ago when we were getting together with some extended family for a little cookout, I knew what I’d be making for dessert! 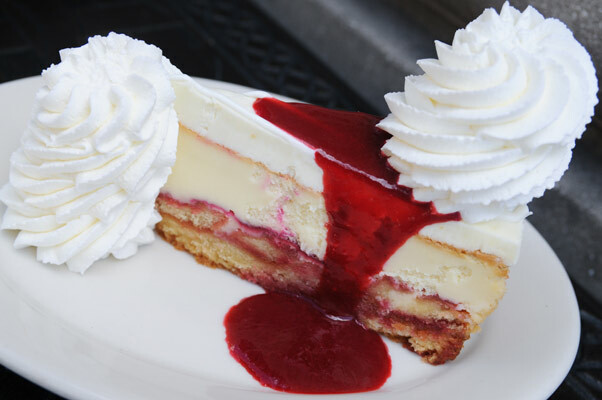 Nothing better than cool, creamy cheesecake on a ridiculously hot day…well, ok, maybe ice cream is better but cheesecake doesn’t melt! 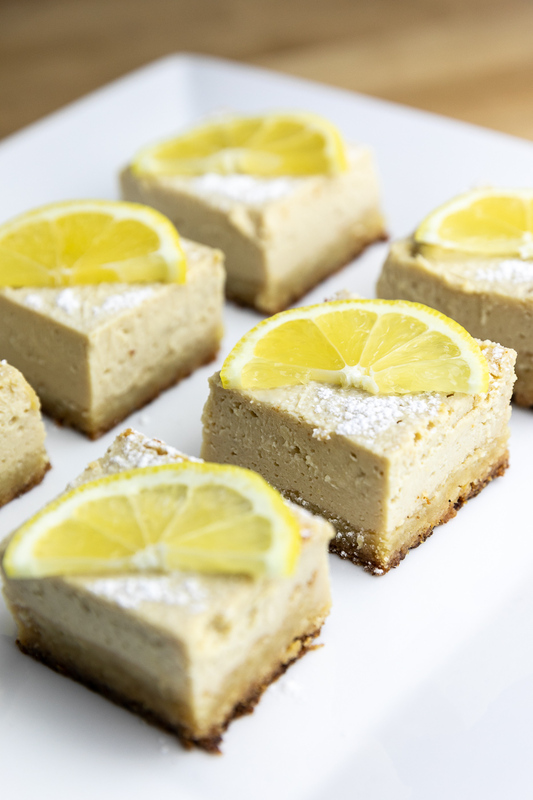 I have a fabulous cheesecake recipe that I decided to put a little twist on with fresh squeezed lemon juice and grated lemon rind. I also topped it with homemade whipped cream, which not only looks pretty but helps balance out the sweetness of the cheesecake. It was fabulous and the perfect ending to a great meal! Combine cookie crumbs and butter. Press evenly into bottom of pan and up the sides an inch or so. In the bowl of an electric mixer, beat the cream cheese and sugar on medium to high speed until smooth. Blend in milk and then mix in the eggs all at once, mixing just enough to incorporate. Mix in sour cream, vanilla and flour until smooth. Beat in lemon juice and lemon zest. Pour filling into crust. Bake for 1 hour and 20 minutes or until the center appears firm. Remove from oven and let cool completely on a wire rack. Chill for at least 4-24 hours before serving. Top with homemade whipped cream just before serving. Yes, I know. Another, ooey gooey bar recipe, Sarah?? For real?! Yes, FOR. REAL. I can’t help it! Trust me, this recipe started off as far away from ooey gooey and baked as you can get but somehow evolved to what you now see! I don’t know what happened, honestly. I intended to make a super fruity, summery, refreshing drink for all of you and somehow ended up with my oven on and my KitchenAid mixer going full throttle. Ugh! I seriously racked my brain for a looooong time trying to think of a unique, colorful and delicious drink and all I repeatedly kept going back to strawberry lemonade, specifically a Sonic Lemonberry Slush. Obviously I love the cherry limeades from Sonic but the Lemonberry Slush is a pretty close second. And all I wanted to do was turn it into…cake. Ooey gooey butter cake. Yes, I have a problem (as documented here, here and here). Sigh. So, I resigned myself to baking and did I have any regrets? Heck no! These ooey gooey bars turned out awesome! 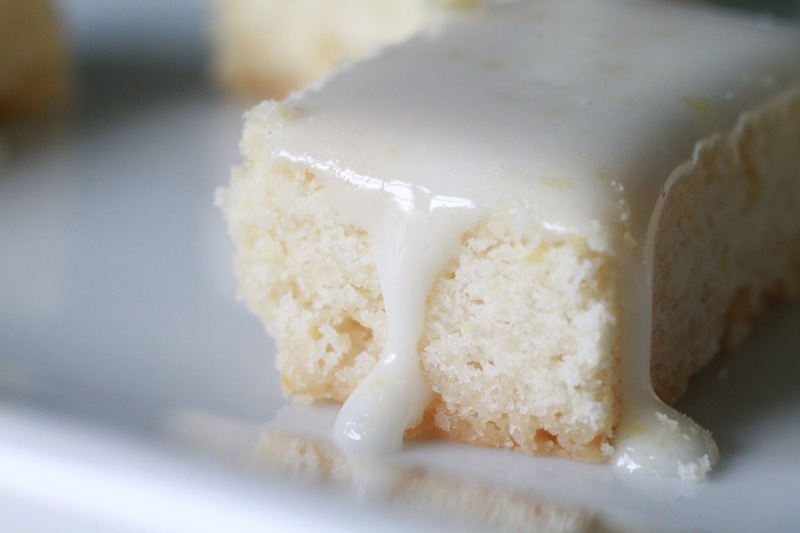 What I really like about these is you could do the lemon cake base and then get creative with the gooey top part. It calls for strawberry pie filling but you really could do cherry, blackberry or even blueberry–they’d all be delicious! Drinks can wait people. Trust me. Preheat the oven to 350 degrees. Generously grease a 9x13 pan. 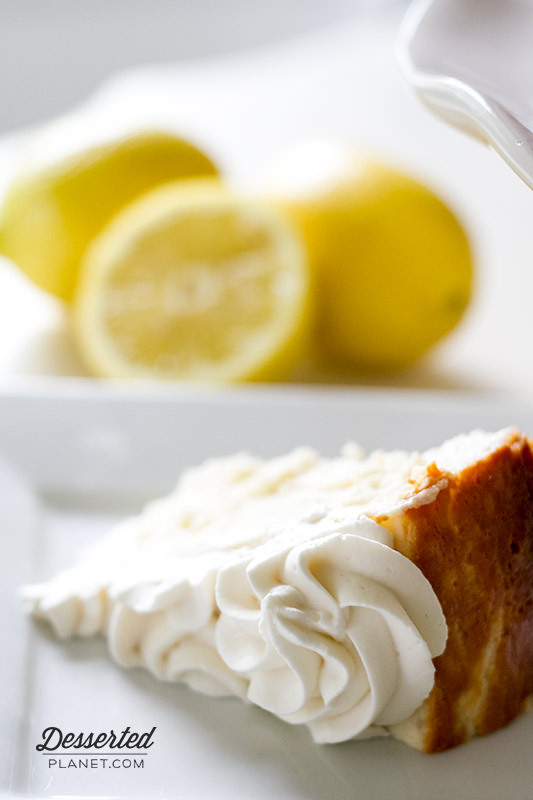 In the bowl of an electric mixer, combine cake mix, egg, butter, lemon juice and lemon zest and mix well. Press evenly into the bottom of the prepared pan and set aside. Still using an electric mixer, beat cream cheese until smooth. Add eggs and vanilla. Add powdered sugar and beat well. With mixer on low, slowly pour in butter. Beat in strawberry pie filling. Pour onto the cake mixture and spread evenly. Bake for 55 minutes and let cool completely on a wire rack. One of Jeremy’s co-workers, Amy, just had her baby, Mr. Cannon Bailey Crocker. He is sweet and perfect and mom and dad are soooo happy he finally showed up. Jeremy’s office is pretty much a bunch of guys (with the exception of Amy) and it’s kind of like one big family…we all know each other, hang out together on occasion and when someone in the office has a baby, the wives make food! So we got a meal sign-up sheet together for Amy and her family and I immediately knew what dessert I was going to make her even before I figured out what main dish I’d be preparing. It’s all about priorities, right?? 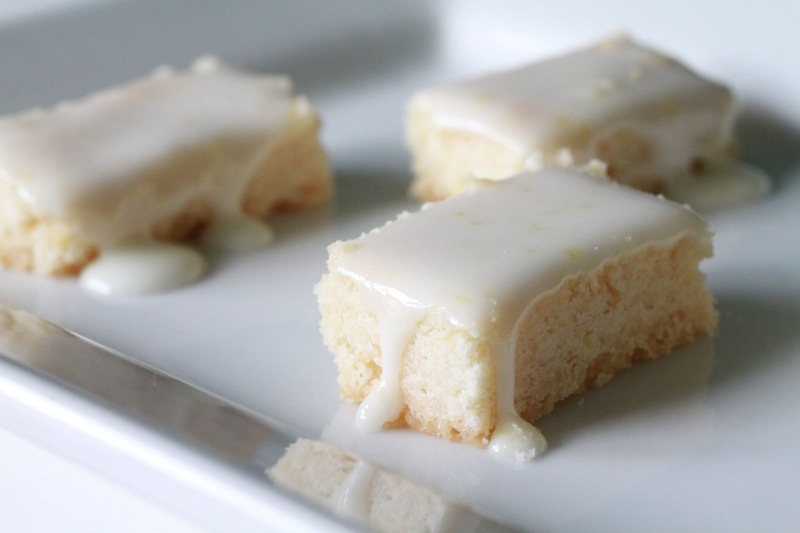 Amy had mentioned not too long ago that she loves lemon bars. Perfect! I already had a couple of recipes that I’d made before but I wanted to try a new one. So I found this one by Ina Garten and it is so, SO good. 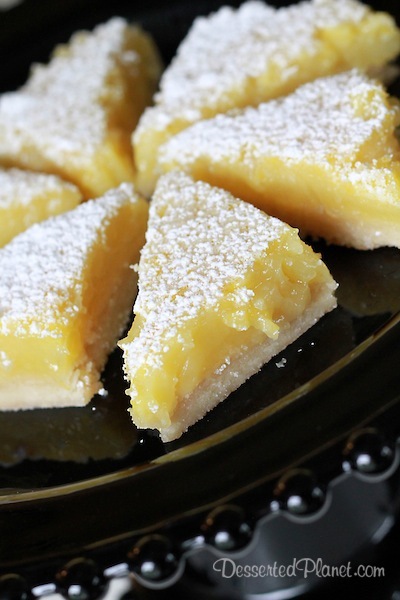 Definitely the best lemon bar recipe I have tried yet, by far. I love the ratio of crust to filling. Usually it’s half crust and half filling (which is not enough filling, in my opinion) but this recipe was about one-third crust and two-third filling. 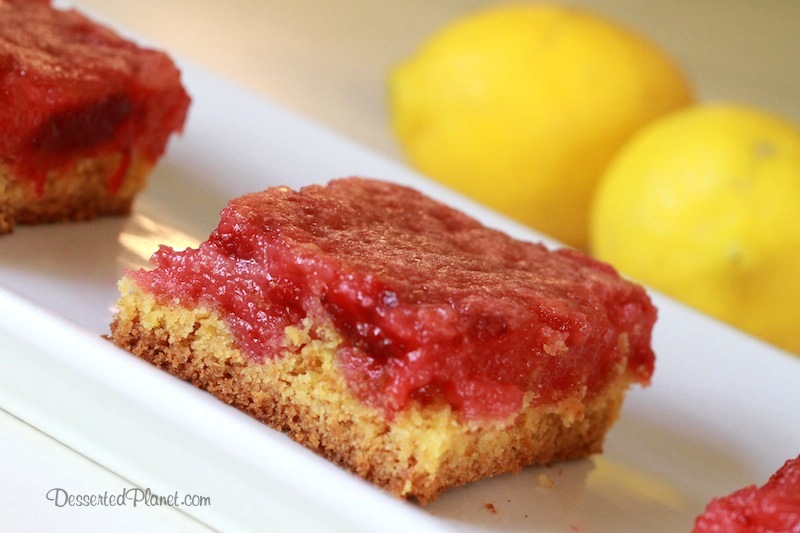 The lemon filling was the perfect balance of sweet and tart and the crust was flaky and buttery. This recipe is a keeper! Preheat the oven to 350 degrees. Grease a 9x13 pan. For the crust, cream the butter and sugar until light and fluffy in the bowl of an electric mixer. Combine the flour and salt and with the mixer on low, add to the butter until just mixed. Add vanilla. Gather the dough into a ball and press gently and evenly into the 9x13 pan. Chill in the refrigerator for 15 minutes. Bake the crust for 18 minutes, until very lightly browned. Let cool on a wire rack. Leave the oven on, set to 350 degrees. For the filling, whisk together the eggs, sugar, lemon zest, lemon juice and flour. Pour over the crust and bake for 30 minutes, until the filling is set. Let cool to room temperature. 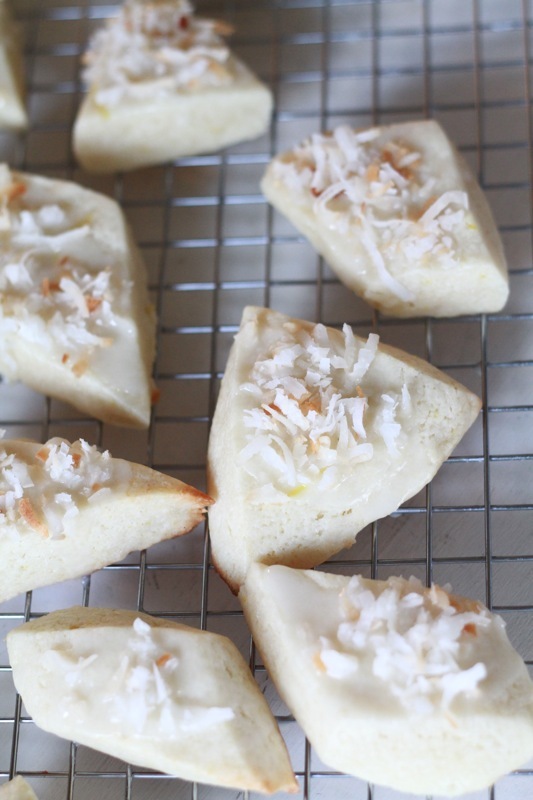 Cut into triangles or squares and dust with powdered sugar. A few days ago I posted some dreamy ice cream treats, one of which happened to be a Strawberry Icebox Cake. As I mentioned in that post, I have wanted to make an icebox cake forever and decided that now was the time! Add in the fact that I had been OBSESSING about making something with blueberries and lemon and voila! This delicious dessert was born. So, was an icebox cake everything I thought it would be? Ummm, YES. And more. I can see why these things were so popular with our grandma’s back in the day…super simple to make and unbelievably delicious. Once the cake sets overnight, the layers of graham crackers get perfectly soft and the thick, whipped cream filling is almost mousse like sandwiched between everything. In my humble opinion this is THE perfect summertime treat…simple, gorgeous and bursting with fresh blueberry and lemon flavor! Enjoy! Note: If you don’t like lemon, feel free to omit it or substitute almond flavor, etc. It’s a very versatile recipe! Line a large, 6½x11x4-inch loaf pan with foil, letting the foil hang over either end of the pan to use as "handles". Spray lightly with cooking spray. In a chilled bowl of an electric mixer (I chill my bowl and my whipping beater in the freezer for at least 30 minutes), whip 3 cups of the heavy whipping cream on high speed until thick and slightly stiff. Beat in ¾ cup powdered sugar and 4 tablespoons of vanilla. Beat in the lemon juice and lemon zest. Spread a layer of whipped cream in the bottom of your pan. Place 4 sheets of the graham crackers on top of the whipped cream (they may overlap a bit in the middle and that's ok). 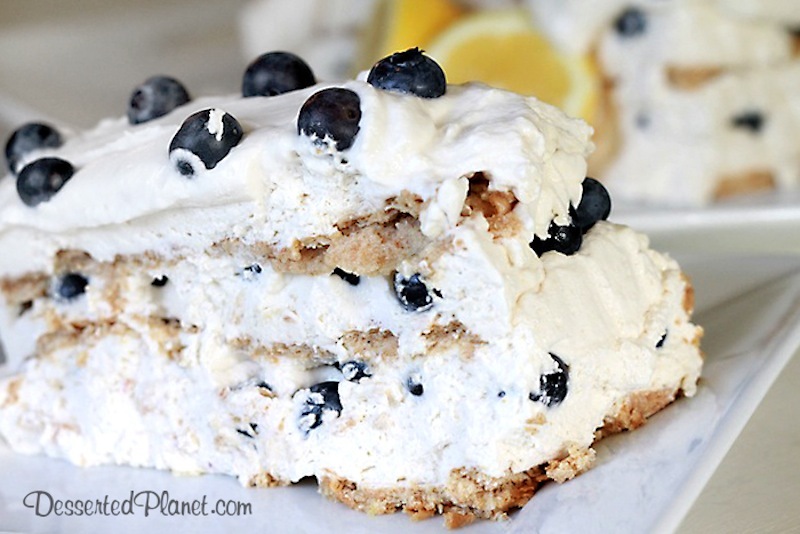 Cover the graham crackers in another layer of whipped cream and cover the whipped cream with a layer of blueberries. 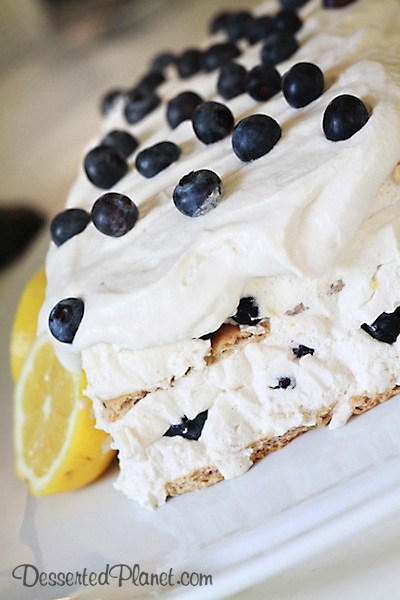 Gently spread a layer of whipped cream over the blueberries. Cover with 4 more sheets of graham crackers, a layer of whipped cream, blueberries, whipped cream and 4 more sheets of graham crackers. Cover with foil and let set in the fridge for 24 hours. 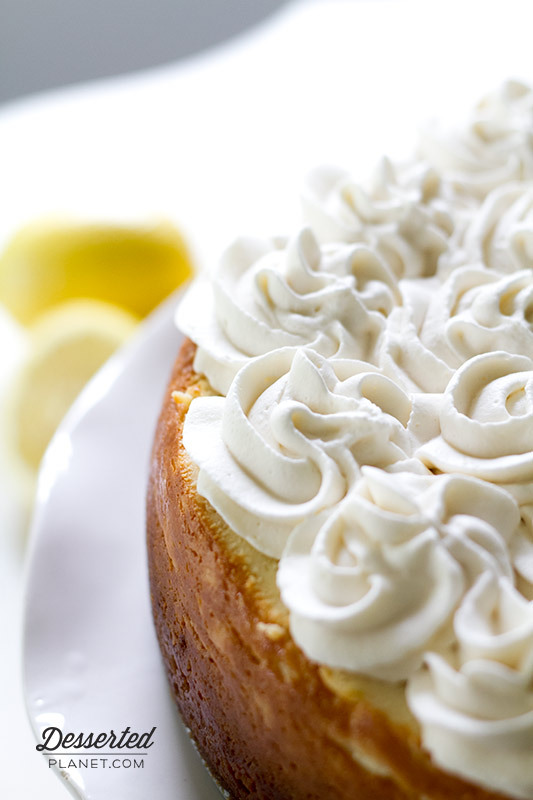 Before inverting the cake onto a plate, whip the remaining 1 cup of heavy whipping cream until thick and stiff. Add the remaining ¼ c. powdered sugar and 2 tablespoons of vanilla. Place a large plate or platter over the top of the loaf pan and gently flip over. Carefully remove the pan and then gently and slowly peel away the foil. Quickly cover the cake with the whipped cream (see note below) and garnish with reserved blueberries. Slice and serve immediately. Serves 10. Note: I only covered the top of my cake with the fresh whipped cream because I thought all the layers were pretty and wanted them to show. This past Friday night we had our once-a-month Gourmet Cooking Club that my friend, Shawna, hosts at her house. It was a pizza themed event this time (yum!) and while everything was delicious, my favorite thing was actually a drink that Shawna made. When we walked into her kitchen there was a beautiful glass punch bowl with what looked like lemonade but with something additional floating on top…basil leaves and sliced jalapenos! Yes, somewhat uncommon for a sweet punch but trust me on this, it is AMAZING. 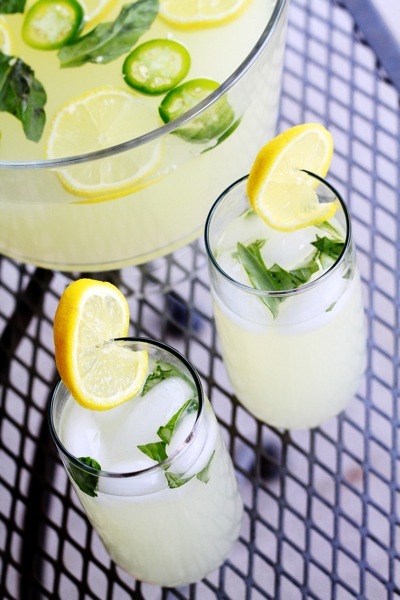 The lemonade is sweet and tart and bubbly and the basil is the perfect, refreshing addition. And then there is just the slightest kick and spice from the jalapeno…it’s barely there but definitely noticeable and honestly, delicious!! Put this one on your list for your Memorial Day party–I guarantee it will end up in your regular drink rotation for the summer! For basil syrup, in a large saucepan combine water, sugar, and basil. Bring to boiling over medium-high heat. Reduce heat. Simmer, uncovered, for 20 minutes. Strain syrup and discard leaves. Cover and chill syrup for 2 to 24 hours. 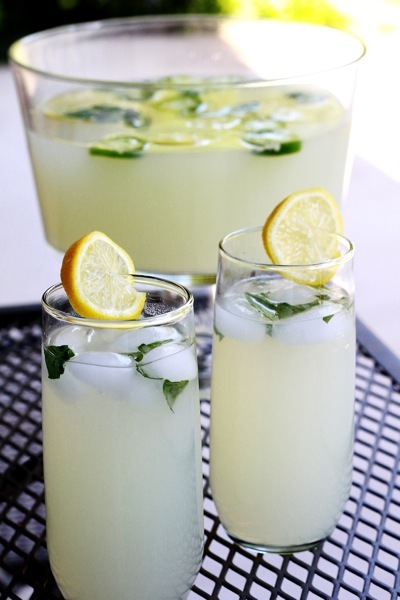 For lemonade, in a very large punch bowl combine chilled syrup, club soda, and lemon juice. 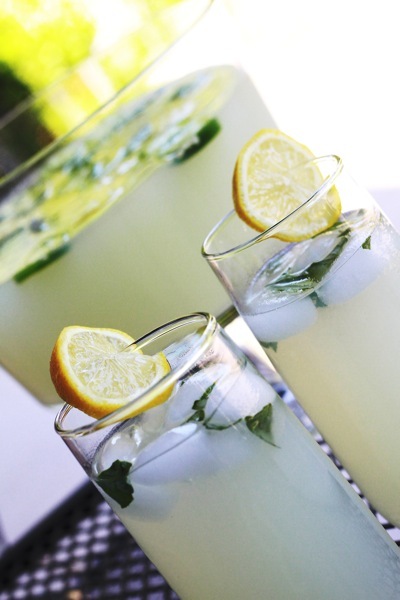 Serve over ice and garnish with jalapeno slices and fresh basil leaves. Makes 16, 8 oz. Servings *Tip:Because chile peppers contain volatile oils that can burn skin and eyes, avoid direct contact with them as much as possible. When working with chile peppers, wear plastic or rubber gloves. If bare hands touch the peppers, wash hands and nails well with soap and warm water. 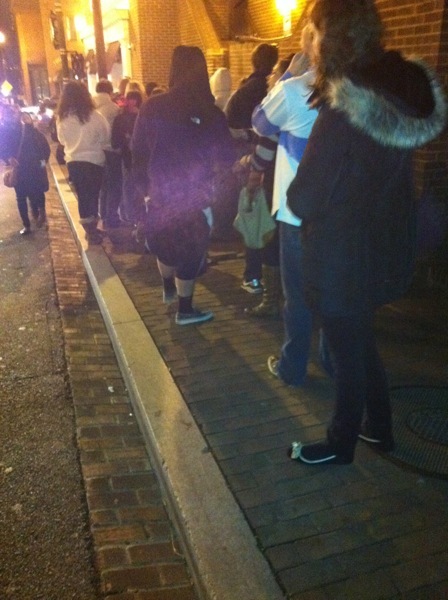 Line outside Georgetown Cupcake. Thank goodness it wasn't too cold! Disclaimer (again): Pics taken with phone, at night. In two different places. 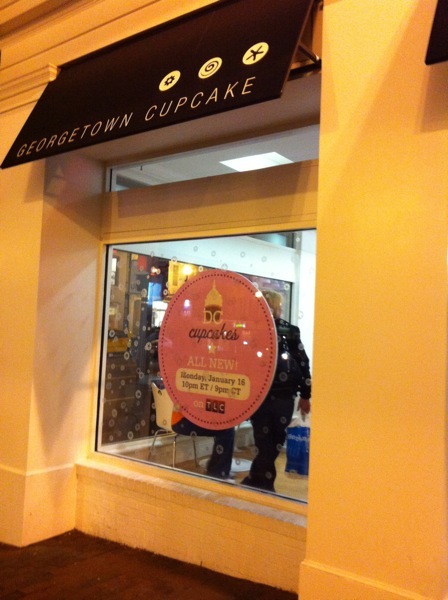 After our adventure at Sprinkles, Joelle and I headed to Georgetown Cupcakes…to wait in a really long line. If you’re not familiar, these gals have a show on TLC and therefore have lines out their door that wrap around the block! It actually wasn’t too bad when we arrived and I believe we ended up waiting about 45 minutes before we got inside. Tried to get a good shot of the action...it was a madhouse. 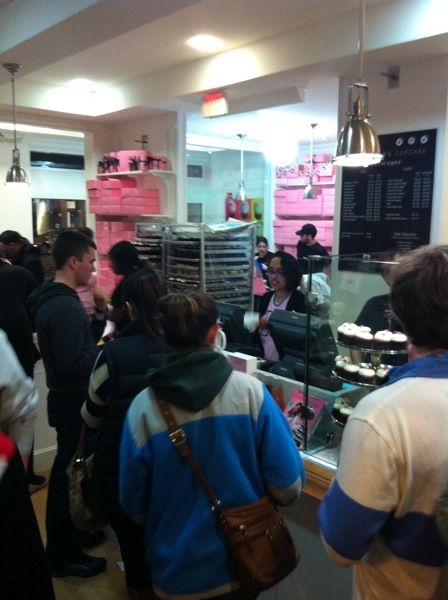 The inside of the store was very cramped and definitely not made for crowds of people/fans. There were only a couple of tables so we knew right away we’d wouldn’t be able to stay. 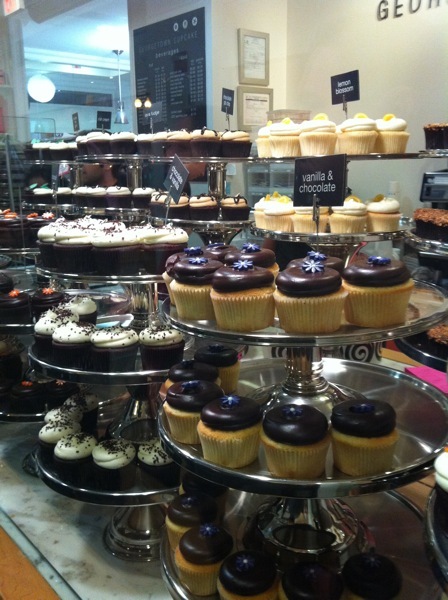 We picked out four different kinds of cupcakes and headed to the next bakery to eat them, hoping there would be adequate tables at the next place. We didn’t have high hopes for this place. 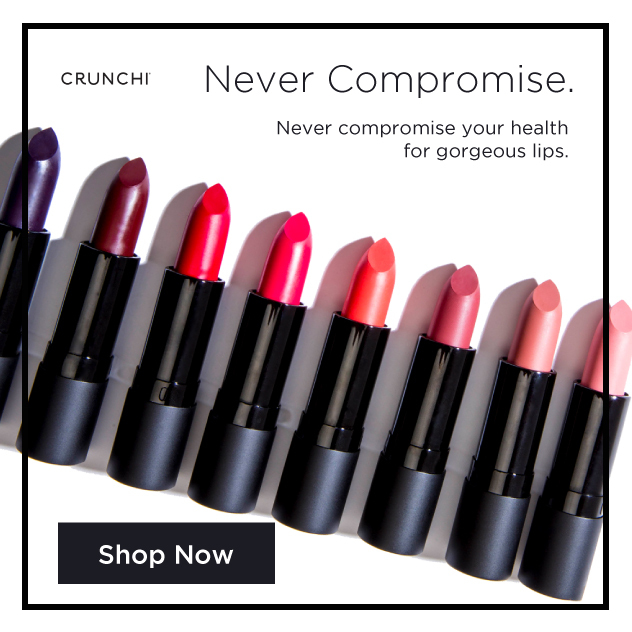 Joelle had tried them once before and had not been too impressed and I had heard from other people that had been there that they weren’t great. So we started trying them and the moment of truth–they weren’t bad! I was honestly surprised! 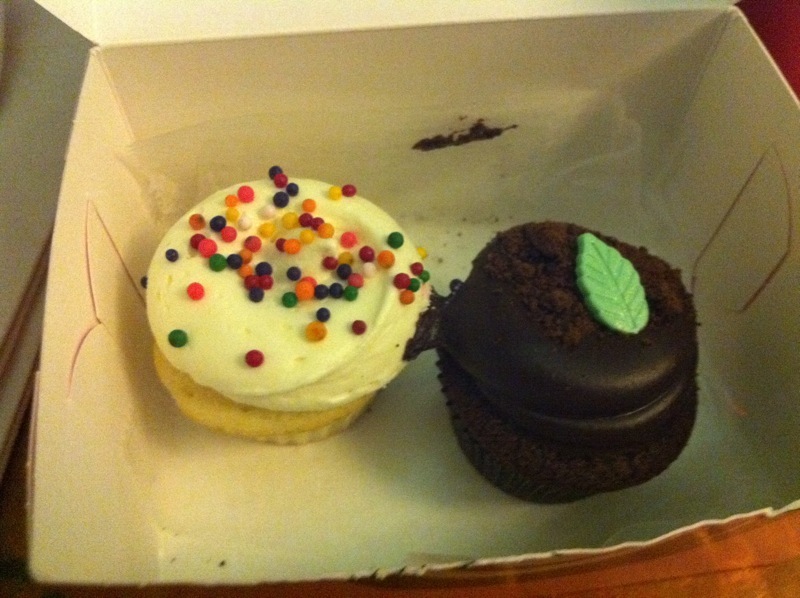 The cakes were all moist and the frosting was pretty good, not the best I’ve ever had but definitely yummy. 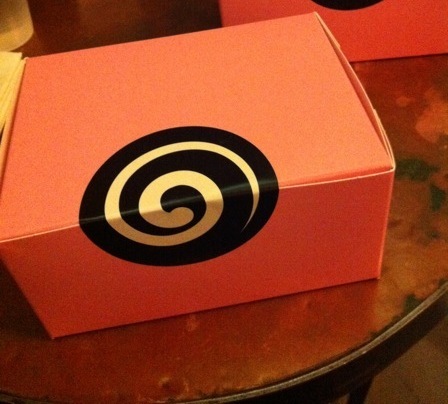 Georgetown cupcake boxes...doesn't quite show how cute the pink boxes were. Vanilla Birthday: Classic madagascar bourbon vanilla cupcake topped with a traditional sweet vanilla buttercream frosting and rainbow sprinkles. Chocolate Mint Crunch: Valrhona chocolate cupcake baked with mint cookie pieces, topped with mint-infused whipped Callebaut chocolate frosting and mint cookie crumble. Lemon Blossom: Light lemon cupcake with a lemon cream cheese frosting topped with a candied lemon. Chocolate PB Chip: Valrhona chocolate cupcake baked with peanut butter chips topped with a peanut butter frosting and a chocolate ganache drizzle. 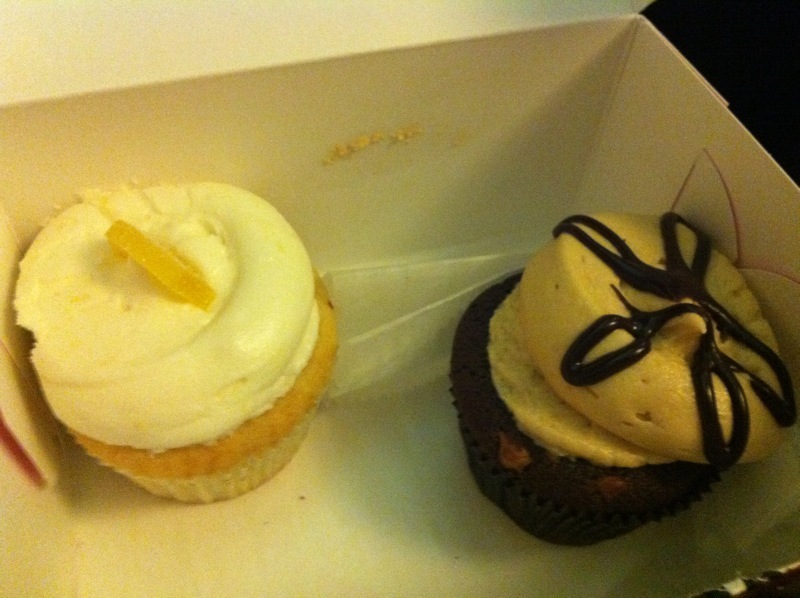 Lemon and PB Chocolate Chip...the peanut butter frosting had a little frosting "landslide" issue on the way to our next stop. 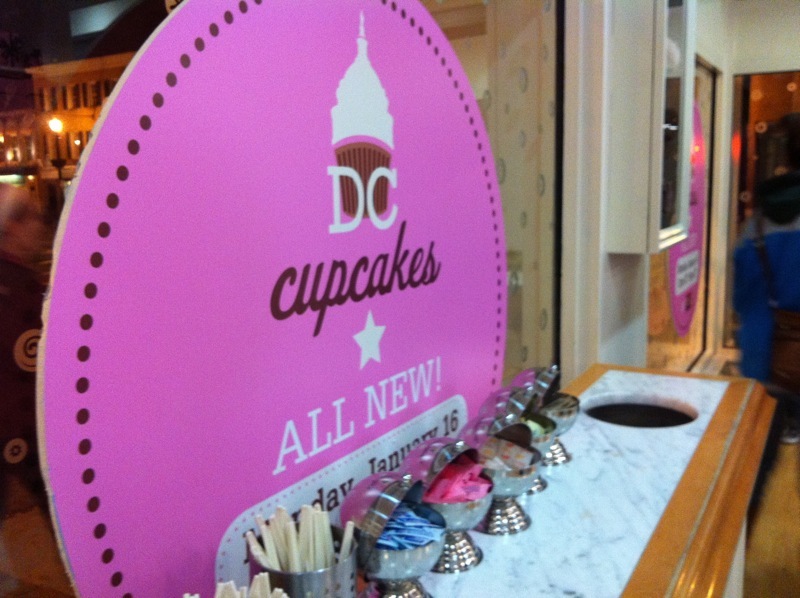 Oh I should mention these cupcakes were UNDER $3 each which was nice! And a total surprise. 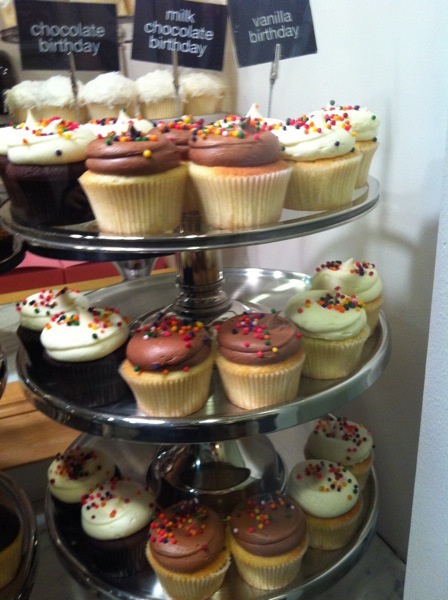 Ok, so who has been to Georgetown Cupcake?? 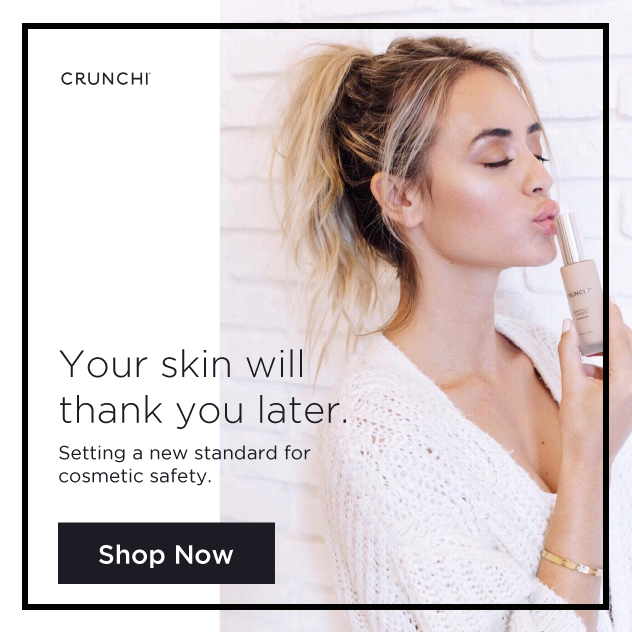 I want to hear your review! Have I mentioned that all I did in DC was eat and shop? Well, it was. And part of that eating included these AMAZING scones that Joelle made while I was staying with her. I had one bite and knew I was doomed. They are light, soft, flaky…just…amazing. They are seriously the best scones I have had yet. Now she made hers a maple flavor which I loved and will most likely do the next time I make these, but I wanted to do something a little “springy-er” so I chose a yummy lemon and coconut combination. I figured with Easter coming up, these would make the perfect sweet addition to a brunch or even a delicious Easter dinner dessert. These scones are also unique because of what’s in the recipe..or should I say what’s NOT in the recipe. They are totally void of eggs and butter! I had to double check with Joelle to make sure I was reading the recipe right. Interesting! And one important thing about these scones–you do NOT want to overbake them (I learned the hard way ugh). In fact, you want to UNDERBAKE them. If they start to get brown around the edges, then they’ve baked too long. The perfect time is somewhere around 16-17 minutes so start checking them around 15 minutes. They’ll probably still look just slightly not cooked on top in the middle but that’s ok..they’re done, trust me! Oh and did I mention these take about 10 minutes to throw together? Gotta love that! Line a 9x9 pan with foil, letting the ends hang over like "handles". In a large bowl, whisk together the flour, salt, sugar and baking powder. Make a well in the center of the dry ingredients and then pour in the heavy cream, cream of coconut, coconut extract and lemon zest. Mix the batter together, by hand, with a wooden spoon until just moist. (I used my hands at the end to get all the flour mixed in.) Pour the batter into the foil lined pan and press into an even layer. Cover the dough with another layer of foil and smooth the top. Freeze overnight. In the morning, let it set out for about 20 minutes. Line two large cookie sheets with parchment paper and preheat the oven to 350 degrees Place on a cutting board and carefully peel away the foil linings. You can slice them however you like; I cut diagonal and then straight across and then cut some of the slightly larger pieces in half for triangles. Bake for 15-17 minutes, checking often to make sure they don't brown around the edges. Let them cool on the pans for a couple of minutes and then move them to a wire rack to cool completely. Top with glaze (see below). 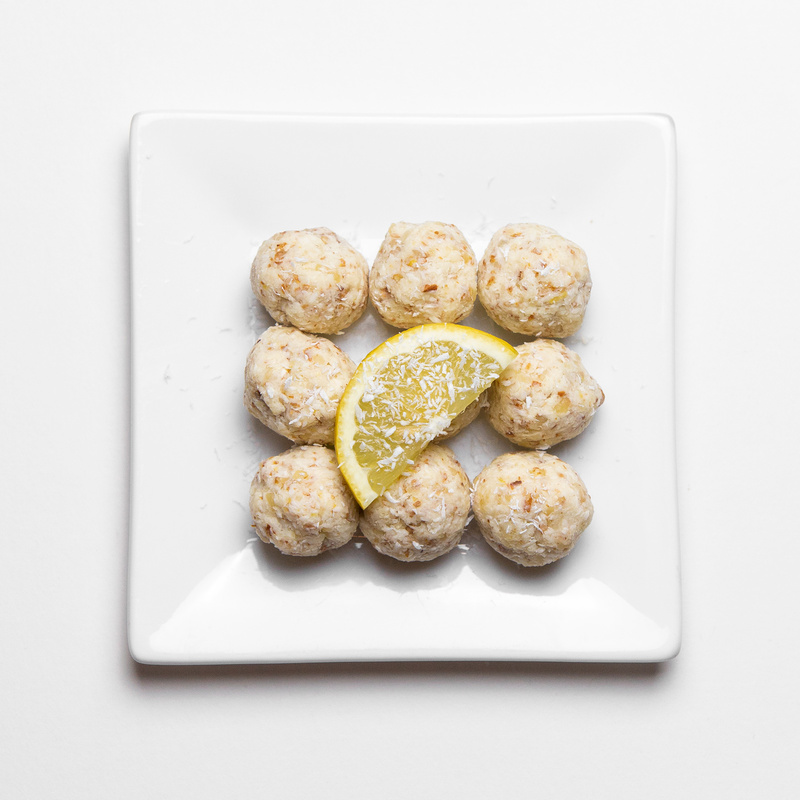 In a medium bowl, whisk together lemon juice and coconut. 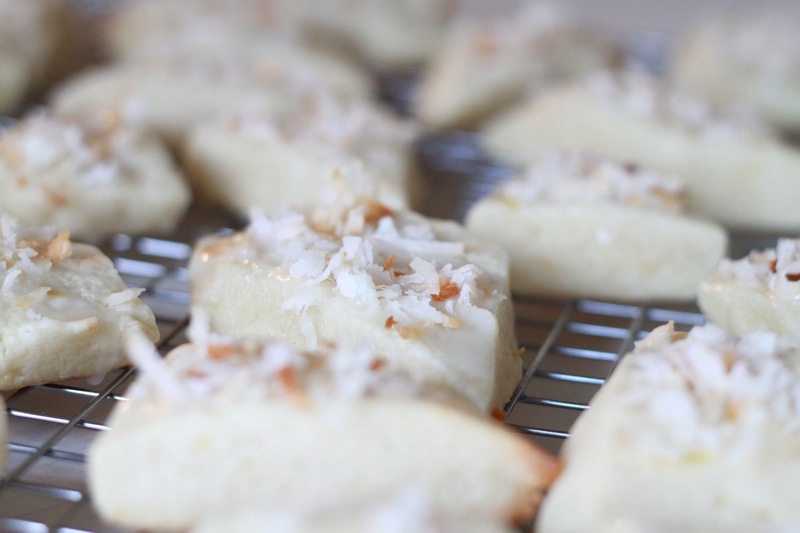 Top each cooled scones with a small spoonful of lemon glaze, sprinkle with toasted coconut and let sit out until glaze has dried and hardened slightly. This weekend I went to the Joyce Meyer conference in St. Louis with a few other lovely ladies. I’ve been several times before and it’s always a wonderful time of awesome music and challenging teaching. 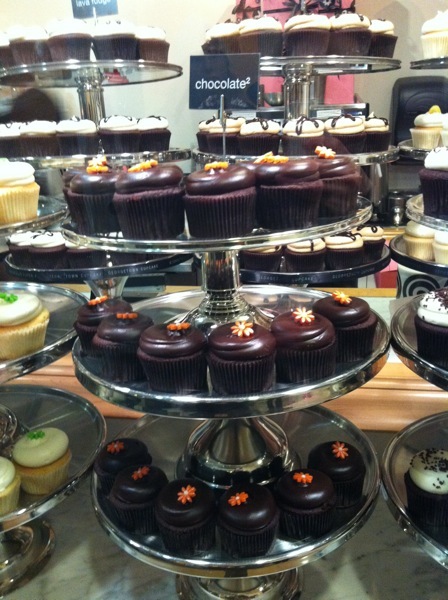 It’s also a great time to sneak in some shopping and splurge on some good eating out! On Friday, our sessions were at 10 a.m. and 7 p.m. so during that gap me, my sister Hannah and friend Nicole high-tailed it to the Galleria for a marathon shopping session. 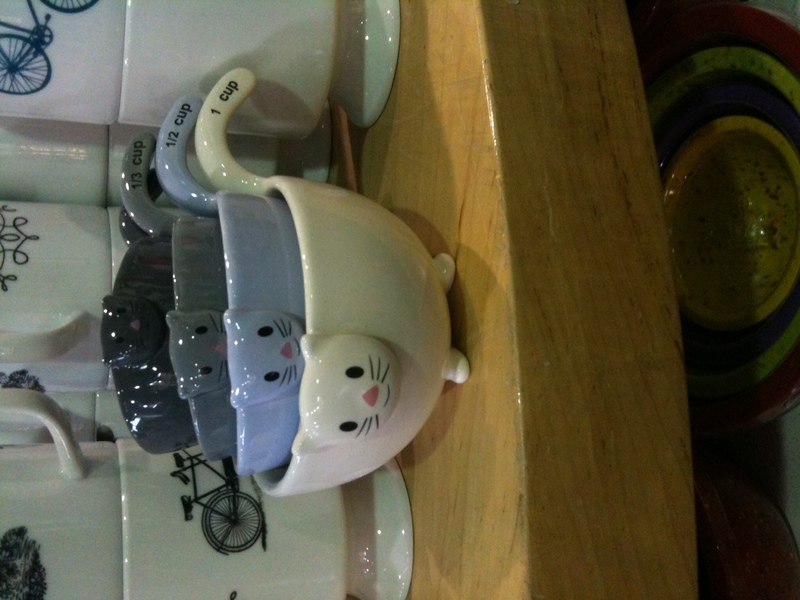 One of our stops was Urban Outfitters where I found these Kitty Cat Measuring Cups. 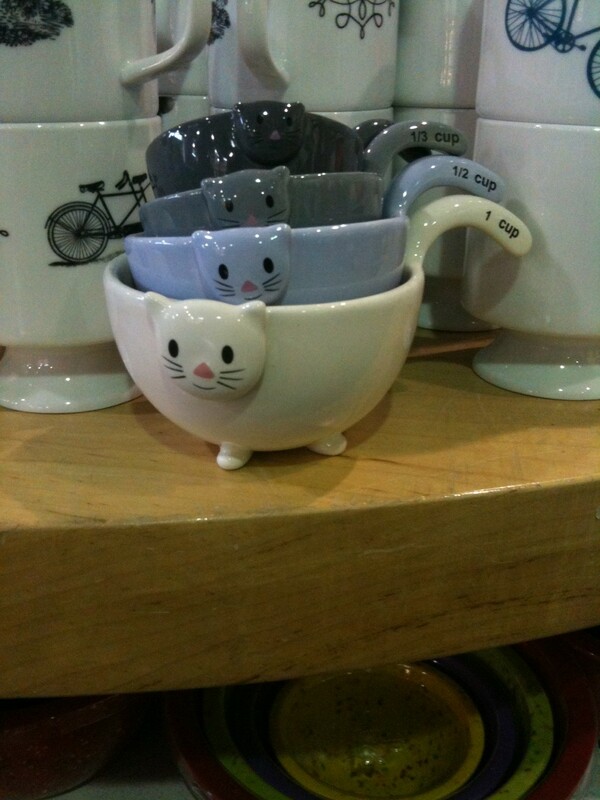 I am a HUGE cat person, so I pretty much died when I saw them. I still regret not getting them. 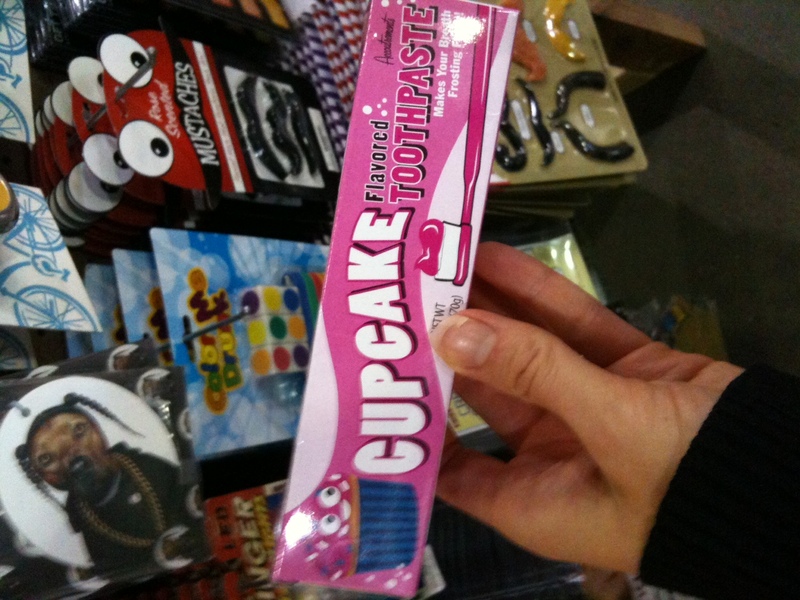 I also came across this toothpaste at Urban Outfitters. 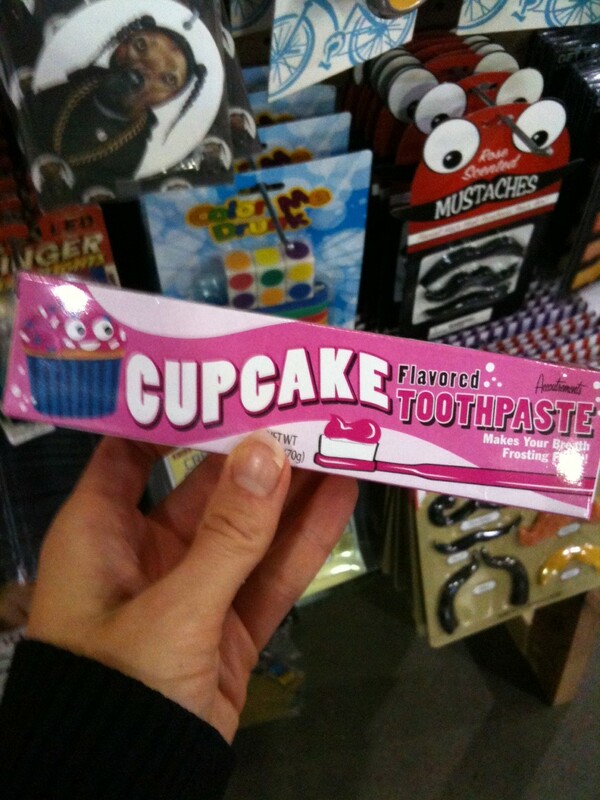 As much as I love cupcakes, I’m not sure I want to brush my teeth with them. That just seems…wrong. 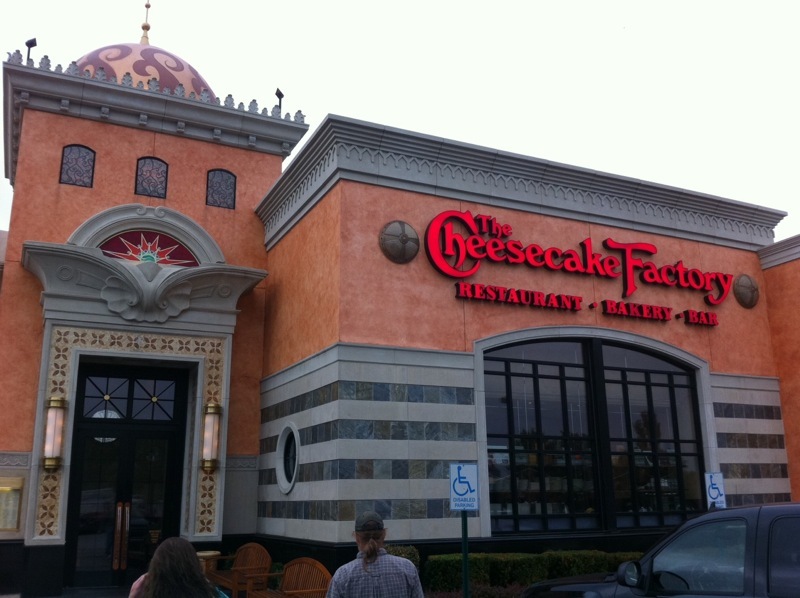 After the last session on Saturday, we went back to the Galleria for the Cheesecake Factory. I know, I know it’s a chain and all but I’m sorry, I love the place. We had some awesome salads and then left. Just kidding! 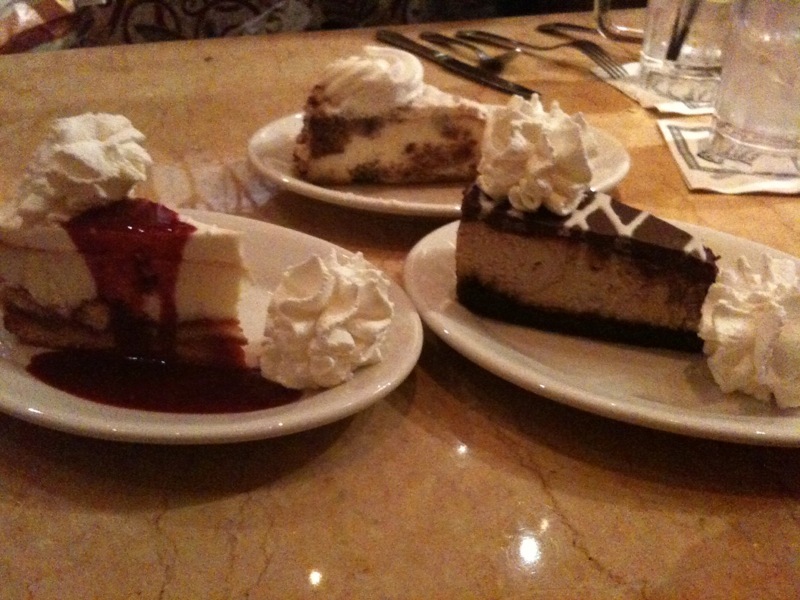 Well, we did have salads but we most certainly ordered cheesecake too! And no, we didn’t share a piece, we each got our own piece. That’s right. Total gluttony. And it was sooooo worth it. Here is a picture of all three of them taken with my crappy cell phone. And here are some beautiful stock photos of what we got. Much better. My sister Hannah got Craig’s Crazy Carrot Cake Cheesecake. It. Is. So. Good. 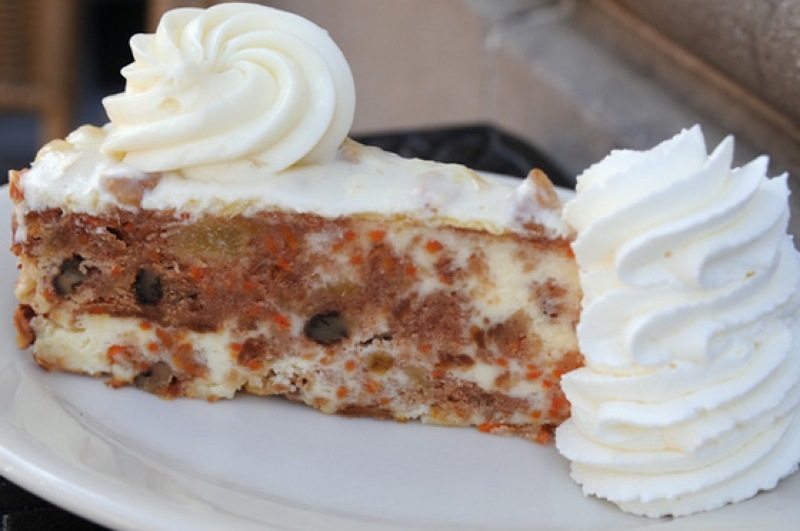 Layers of carrot cake, vanilla cheesecake, cream cheese frosting and toasted pecans. Amazing. I got the Lemon Raspberry Cream Cheesecake which consisted of Raspberry-Vanilla Cake, Creamy Lemon Cheesecake, Raspberry Lady Fingers and Lemon Mousse. It didn’t have the lady fingers and didn’t quite look like this photo and wasn’t really my favorite, BUT it was good. Just not my favorite. What was my favorite? 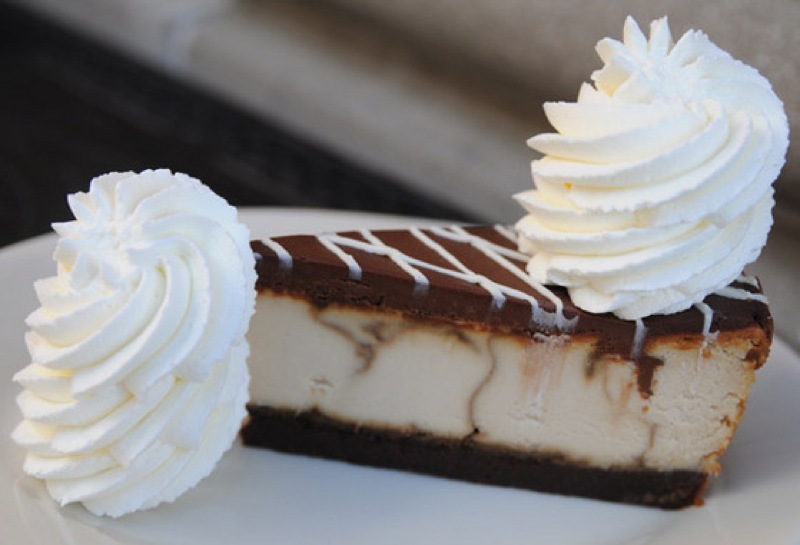 My friend Nicole’s choice, the Kahlua Cocoa Coffee Cheesecake. OMG. I know that phrase is overused but seriously, OMG. It was so, so, so good…a yummy brownie crust with a hint of coffee in the uber-creamy cheesecake filling and some seriously rich chocolate mousse and ganache on top. I was *this close* to choosing the Kahlua cheesecake and I was KICKING myself for changing my mind at the last minute. However, Nicole couldn’t quite finish all of her piece so like the good friend I am, I volunteered to help her out. I had such a great weekend and was so sad to see it end but I’m thankful for the girl time and most importantly, God time. And now, I’m gonna shut down my computer on this dreary, rainy Sunday afternoon and hold my husband’s hand as he rides the emotional rollercoaster that is fantasy football. Hope everyone has a lovely Sunday evening.